Having a baby is such an exciting time in a parents life and a throwing a baby shower is a great way to gather friends and family to celebrate with the new parents-to-be. I’ve hosted many baby showers for friends and I’ve had fun with every one of them. I enjoy finding new theme, decor and game ideas. One day while browsing the internet I came across BabyShowerStuff.com and I just fell in love with their products! For those of you planning on throwing a baby shower in the near future, they have everything you need to make the baby shower unique and fun. So far I’ve used game ideas 1, 5 & 10 listed below. Here I’ll share with you some of the fun games they have on their site. They make throwing a baby shower easy! Just click on any of the images below to be linked directly to their site. 1. Who Smells The Stinky Doo? These cute Scratch ‘n Sniff cards are sure to provide a few laughs for your guests. The pack of 20 cards contains 19 baby powder fresh cards and 1 stinky card. The person “lucky” enough to get the stinky card wins! While throwing a baby shower, there are usually a diaper game or two included in the planning. 2. Why is Mommy’s belly so big? Is it gas? Did she have too much for lunch? Is there really a baby in there? This super cute scratch game includes 20 scratch cards but only one lucky enough to have the cute baby. Scratch games make throwing a baby shower and game planning even easier! 3. My Water Broke! This is a fun game that I’ve played at a few of the showers I’ve hosted. After the guests arrive, provide each with a special ice cube. The first person to have their baby break free from the ice cube wins…but only after shouting “My Water Broke!” Throwing a baby shower is a fun time to plan a few silly games. Famous Families – Match the famous celebrity with their child. Oh Baby! – See how many songs, phrases, or movies your can think of that use the word baby. Who’s Your Mommy? – Guess the name of each of the animal baby’s mommy. What’s Mommy Wearing? – Be the best at remembering what the new mommy is wearing. Baby Busters – Decide if the 20 pregnancy statements listed are fact or myth. There are a variety of different themes available so you’re sure to find one that’s perfect for your mommy-to-be’s special day. 5. Dirty Diaper Game: Throwing a baby shower just wouldn’t be the same without a few good poo games, right? This game includes little diapers that you can pin onto guests as they arrive at the party. At some point during the party, ask “Does anyone else smell that?” and ask guests to check their little diapers. One has a brown fabric paint inside to resemble a little baby poo. Hooray! That person wins a prize without even having to change the poopy diaper! 6. Words Of Wisdom: There is so much to learn when becoming a parent. New parents rely so much on their friends and family that have been there before to provide words of wisdom. 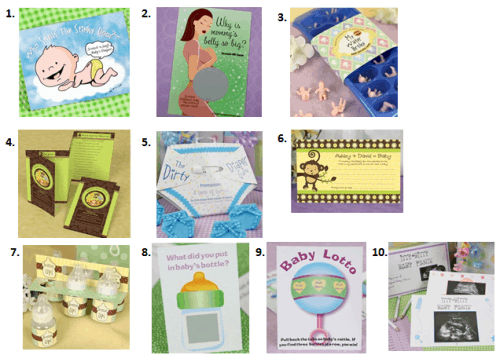 These sweet & personalized advice cards are a great activity to try when throwing a baby shower. There are many different themes to choose from so you’ll be sure to find something that fits into your theme. Have each guest write a tip to the new parents-to-be. Collect these cards and use them to create a scrapbook for the new parents after the shower. A special added touch is to try to get a picture of each guest at the party and then include their picture along with their advice card in the special scrapbook you’ll create. 7. Baby Shower Drinking Game: Yes, you read that right…a drinking game at a baby shower! Don’t worry – no alcohol involved! Bottles Up is a fun game where you fill each bottle with a beverage of your (or the guest’s) choice and then countdown…3…2…1 – Chug! If you’re throwing a baby shower with both guys and gals in attendance, the guys are sure to enjoy this game. The first person to chug their little bottle is the winner! 8. Who Has The Milk? This fun scratch game is easy to play and doesn’t require too much interaction so it’s good for even your shyest or youngest guests. The person to find the milk in their bottle is the winner! 9. Baby Lotto: This is another game that is good for even the shyest or youngest guests at your shower. The person that uncovers 3 bottles in a row is the winner. 10. Ultrasound Baby Shower Game: If you’ve had an ultrasound for your baby or even been shown the ultrasound of a friend’s pregnancy, you know how difficult it is to distinguish between all of the different parts. One thing is for sure – that first glance at your baby is a moment you’ll never forget! This fun game comes with 12 ultrasound picture cards with various parts numbered and the goal is to match the correct parts on the provided word lists (also included). All of these games make throwing a baby shower even easier. The games come fully prepared and ready to go! I hope these ideas and games help your planning while throwing a baby shower. For more baby shower tips, theme ideas and free printable games, please see our Baby Shower page. For unique baby shower favors and gifts, check out the adorable selection on Beau-coup (a Moms & Munchkins affiliate code). We’re always adding new ideas for baby showers, family fun and more! Stay updated by following us on Facebook, Twitter, Pinterest and Bloglovin’. *Disclosure: I am part of the Big Dot of Happiness affiliate program.